Kenyans appear have no sense of learning from History or the Bible itself. It is a Biblical fact that the Children of Israel languished in wilderness for 40 years before Joshua delivered them to the promised land of Canaan after leaving Egypt where they were slaves. There are no Biblical records that Joshua wanted to oust Moses or constantly sought leadership. It was God’s will. The Kenyan context is fairly simple to those who respect history. We were British colonial subjects aka slaves form 1920 to 1963 – roughly rounded up to 40 years. The Mau Mau struggle led by young Dedan Kimathi as their Joshua decided to liberate Kenya in a bitter Mau Mau War, which today is dismissed by pseudo professors as a ethnic uprising because they never experienced Emergency’s anguish in villages and concentration camps that have been every well documented by the British themselves – including an apology a few years ago. Mau Mau victory that led to independence in 1963 was hijacked by a party known as Kanu alias Baba na Mama for a good 40 years until 2003 when a 71 year Moses alias Mwai Kibaki took over the responsibility to deliver Kenya to the promised land of milk and honey in Canaan. 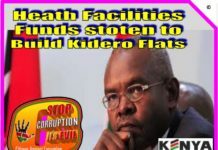 He managed to deliver some milk by reviving cash cows known as KCC and KMC which had been milked dry by Dictator Daniel arap Moi and his Court jesters including a Kanu Secretary General Riala Amolo Odinga, who ran away with billions of shillings worth of Kisumu Molasses. Raila denied his Luo tribesmen direct share in ownership for money they had contributed to co-own the factory. In March 2009 Raila told the meeting of some contributors that the locals raised Ksh 1.7 billion while Spector International raised the balance. He said that the company had started making profits and would soon be floated on the NSE. That was never to be. Spectre International recently failed to pay one of its suppliers, Subira, despite a court order, which was issued on December 2016. To date, a debt of a small amount of Ksh 10 million is still outstanding and forced Subira to go to court to apply for a winding up order of the multi-billion which was granted. In a notice published by a local daily, Lady Justice Njoki Mwangi on March 23, 2017 granted the order to Subira in a move, which will see Raila lose the factory worth billions of shillings if he does not pay the debt or elected president. His foreign partners have been milking the factory. 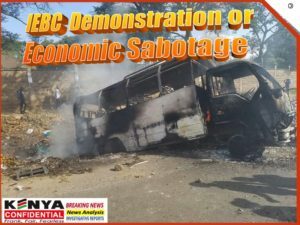 Methanol from the factory had been blamed for deaths of youths in their prime economic age in most parts of the country with central Kenya suffering the highest toll – perhaps to reduce their voting numbers. 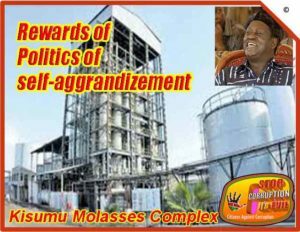 The land on which the molasses plant stands was handed to the Odinga family firm after the intervention of none other than President Moi. The 240 acres was offered to the Odingas’ company Spectre International by former Lands commissioner Sammy Mwaita just five days after Kanu and the now defunct National Development Party, headed by Raila, entered into a partnership that eventually led to a merger of the two parties under Moi. Mwaita himself is alleged to have acquitted a chunk of the land that was developed for residential use earning a cool Ksh 1.5 billion that launched him into politics. After mortgaging Luo MPs Raila was given cabinet posts, which included roads and housing portfolios. His first pledge as Roads Minister was he would make Outer Ring Road in Nairobi a dual carriage highway. It is now being built as a dual carriage highway by Uhuru government as you read this. He also promised to blacklist cowboy contractors who were building killer highways and abandoning government projects undone. He did not and some turned out to be his best friend despite plundering billions from the national economy in abandoned projects that cost more money to complete. Back to Kenya’s Moses alias Kibaki. He had a very difficult time as rebellious Raila demanded implementation of a Memorandum of Understanding (MoU) written by some lawyer friend in Nairobi hotel providing for a Prime Minister and 2 deputy vice presidents in total disregard the Constitution. His idea is the same on which he has crafted similar positions for NASA that are NOT provided in the current Constitution. Come 2005 and the same Raila tore away a Constitutional draft proposed in a referendum that gave birth to Orange Demagogic Movement when Kenya was in political Sinai Desert. Raila always insisted on being consulted by Moses on all matters of delivering Kenyans to Canaan and in 2008 ordered rebellious Canaanites on Mass Action riots in which 1,500 of them died. Many others still live in hardships created by the Mass Action chaos occasioned by the man who claims to be a Joshua to deliver Kenya from a four and half government that has performed better than during his tenure in Moi and Kibaki governments out of which he was Prime Minister in charge of supervising and coordinating government ministries for 5 years. 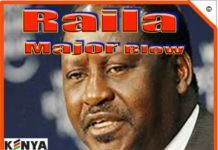 Raila rode on the tide of innocent blood to the Pinnacle of Majesty alias Prime Minister’s office. An office that cost Kenya billions of shillings in economic destruction as had happened in 1982. His NASA has now promised to create for MaDVD with two arch angels of Weta and Jicho Pevu in what they call Penatgon. Offices, which will eat into the national economy to enrich the lifestyles of four men already millionaires – courtesy of public taxes – instead of improving national security. 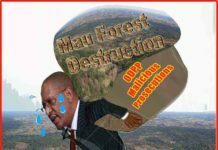 Confounded Moses was in 2008 forced to literally abandon the journey to Canaan after billions of shillings were destroyed in mass action carnage and bloodbath along with 650 Internally Displaced Persons (IDPs). Giving a family a small unit of 5 that would mean over 3,250,000 Kenyans whose lives were disrupted forever. Many of them lost homes that went up in flames, farmlands that were occupied by neighbours or strangers. Others lost their millions of shillings worth of businesses they had built over the years. Their children’s education and lives were disrupted and other family inconveniences. These are the people Kibaki government paid in excess of Ksh 8 billion – money that could have been used to build more public schools, health facilities, housing projects and roads among many other amenities if Raila had not called for Mass Action to achieve his dream to become Prime Minister. This was a major blow to the National economy from which it has yet to recover fully almost a decade later. 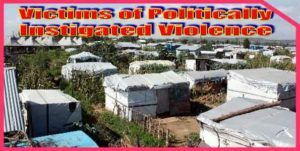 The Daily Nation in an article dated December 29, 2011 said; “Internally Displaced Persons (IDPs) have become a permanent feature in our media, especially following the formation of the National Accord. Of concern was the immediate resettlement of persons displaced following the post 2007 election violence and to fix any problem perceived to have played a role in the chaos. For the last three years, reports have been released commenting on the achievements made so far in regard to the Agenda Four items. Just like commonly held: Kenyans tend to gloss over things so easily: the least achievement reported yearly has been the issue of IDPs—both in terms of not only resettling them, but finding a durable solution for the issue. And the failure has mainly been because of our fixation to fix the problem, not find a durable solution to the issue. Having glossed over the reason for internal displacement in 1992, 1997, 2002 and 2007 in Coast, Rift Valley and Western parts of the country, we have moved from hiding basic facts about causes of displacement in these areas and want to portraying the problem as lack of funds to carry out the exercise. The latest figure given out by the Ministry of Special Programmes for the resettle now stands at Ksh8 billion (by December 2011). Government has already paid Ksh10,000 to 169,759 households, Ksh25,000 to 37,788 households and allocated 2,287 households land. However, information given out on IDPs is misleading and not enough is shared to help solve the issue. Further, the government secured a $19.5million loan from African Development Bank to construct and provide farm inputs to 19,000 households in Rift Valley province while the UNDP pledged $1.66 million for youth and women in Nyanza, Western and Rift Valley. The failure to solve the IDPs problem in Kenya so far has not been because of lack of resources, but because the Government (in which RAILA was Prime Minister for 5 years) —though being a signatory to the African Union Convention for the Protection and Assistance of Internally Displaced Persons in Africa, adopted in October 2009 and the UN’s Guiding Principles on Internal Displacement— has failed to observe guidelines during its interventions. It was not by political accident that when Raila presented himself to Kenyans seeking to be their president in 2013, they rejected him despite his claims his victory was stolen. Two political beginners with less than 10 per cent of his political experience, including electoral rigging and also facing State House project Musalia Mudavadi, had no means by which they could steal from a sitting Prime Minister and a sitting Vice President enjoying the benefits of incumbency. Similarly it is no wonder that when the frustrated Moses (Kibaki) term ended, Kenyans decided they would not replace him with an old non-performing Moses who today claims to have converted to Joshua. Majority of Kenyans decided they would give that chance to young Biblical Joshua’s age mate in the name of Uhuru Kenyatta. The fellow had gone through harrowing experiences with constant accusations including facing charges before International Criminal Court of crimes committed during Raila initiated Mass Action. Uhuru may have funded Mungiki in counter-offensive against the marauding killers in the Rift Valley, Naivasha and Nairobi slum settlements but that was in self-defence. Mungiki intervened at a time when police, whose Director of Operations was former Inspector General David Kimaiyo, now seeking to be Elgeyo Marakwet Senator, were telling people fleeing for their lives, “mlisema kazi iendelee, inaendelea.” Many were chased away from police stations and killed. Mungiki saved thousands of lives and thanks to Uhuru if he funded them. Kazi iendelee was Kibaki’s Party of National Unity (PNU) re-election slogan. It is in the interest of protecting Kenyans from politically-instigated slaughter, as has happened over the years, that billions of shillings have been directed towards security expenditure against constant condemnation by the opposition that appears thirsty for human blood since the Moi era so-called “land clashes”. The opposition also wants foreigners to give a helping by way of giving terrorists freedom to usurp parts of Kenya by withdrawing Kenya Defense Forces when terrorism is draining enormous amounts of cash that could go into building the national economy. 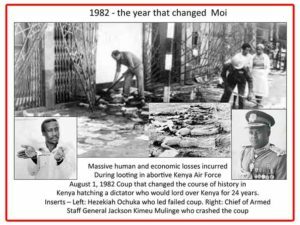 Thousands of Kenyans have been slaughtered repeatedly since the failed military coup on August 1, 1982 and in post-election violence in 1992, 1997, 2002 and 2007/8 in Nairobi, Coast, Rift Valley and Western parts of the country. 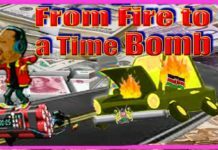 All those politically driven economy-damaging episodes of violence have translated into billions, indeed, trillions of shillings in national economic destruction. The failed August 1, 1982 coup saw massive economic blows in losses of (a)1,500 young men with long lives ahead of them to contribute economically. (b) Business enterprises were looted such that their owners never made a recovery. 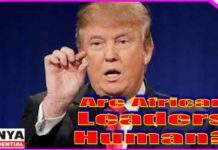 (c) insecurity it triggered led to billions in illicit cash transfers and money laundering by leaders and public servants not sure of their future in Kenya (d) Many businessmen of Asian descent fled the country after their daughters and wives were raped and their premises looted. 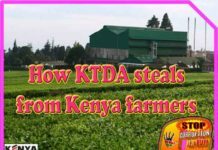 Their departure headed for the United Kingdom, Canada, and Australia was a huge drawback to Kenya’s economic growth and a major scare to potential investors badly needed by the Moi government, which was just four years old – like Uhuru’s. Moi had taken over the reigns of power in 1978 from Mzee Jomo Kenyatta who had laid a firm economic foundation like his son Uhuru has tried to do after taking over from Kibaki, whose dreams were disrupted twice by in 2005 his third year in a defeated referendum and in 2008 Mass Action. 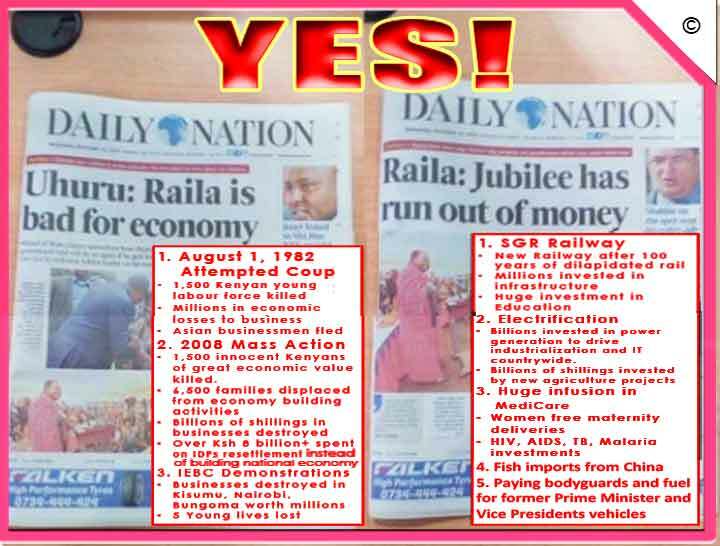 Like the August 1, 1982, Raila is making efforts to oust Uhuru’s young government in its fourth year come August 8th. 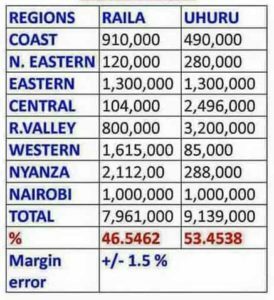 If history repeats itself Raila will fail dramatically and more so with a superstitious mindset that saw IEBC deadly and economically destructive demonstrations solely aimed at removing Chairman Ahmed Isaack Hassan because he declared him a loser in 2013 and therefore a bad omen. August does not augur victory for him. But Kenyans have a very short memory and many who are driven by ethnic hate do not care when fellow Kenyans are killed in political violence. Millions who will be voting on August 8th were not born in 1982 and many more were too young, some only 10 years old, to clearly grasp the harrowing misery inflicted upon their fellow citizens by the mass action violence in 2008. 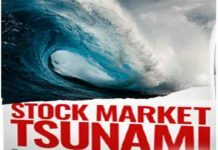 A large number cannot relate political violence to economic losses political violence in which businesses are looted, properties destroyed and lives lost. Others are blinded by their ethnicity. To them political violence is a tribal way of life having grown through many incidents that have never been punished. That is why they join vigilante groups for hire during political violence. Uhuru is being accused of borrowing too much to reconstruct some of the damage inflicted by Kanu neglect and frequent post election violence damages. Nobody seems to tell Kenyans how many BILLIONS the country loses in post-election political violence when they talk about Eurobond among other unsubstantiated claims. The Billions of shillings spent by families to bury their dead, the loss of able-bodied human beings in 2008 and subsequent heavy cost of resettling IDPs, businesses and investments lost, is money Kenyan should never have lost and which by far exceeds Eurobond claims. 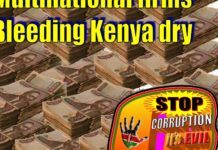 Kenya’s heavy borrowing is funding long-term investments, when political violence inflicts long-term economic losses to the people of Kenya and their Motherland. Like Kanu, the Baba na Mama party, hijacked Kenya after 40 years of British slavery, born again Joshua alias Baba na Nasa (not mama) wants to kidnap Kenyans and divert their journey of enjoying the fruits of new found Canaan. That is one of the many reasons why Baba alias Raila Amolo Odinga is bad for Kenya’s economy! Kenyans must choose the direction their country will be driven by politicians after August 8th 2017 General Election. They must choose Peace not Anarchy. 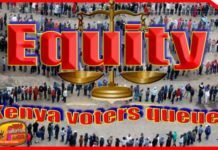 The coming elections should mark the departure from ethnic-based choices that have continued to drag Kenya though economic chaos disguised as political advocacy. Kenyans must begin thinking about themselves as Kenyans not tribes and ethnic blocks used by politicians as power gambling chips. 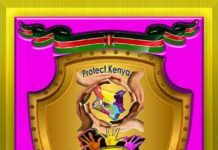 Kenya will never advance socially, economically and industrially unless we adopt and embrace our Motherland Kenya as the basis of our Nationhood. We share the ground we walk or drive on, we share the air we breath, we share the food we eat, the water we drink, without considering their ethnic sources because they don’t exist in real life. Our ethnic origins should be the roots with which to support our Nationhood not the reason to hate one another.